Food Paper, a monthly and fully colored baking publication magazine filled with creative ideas, know hows, step by step features on interesting baking menus. A joy to read, to keep and to learn on the latest trends in baking. Every recipe has gone thru tried and trial process. There are also many interesting lifestyle columns on Thailand’s leading hotels, elegant restaurants and delicious menus from their in-house bakeries. The inside articles talks of the latest trend on recommended cafés and bakeries and the updates on baking trends. 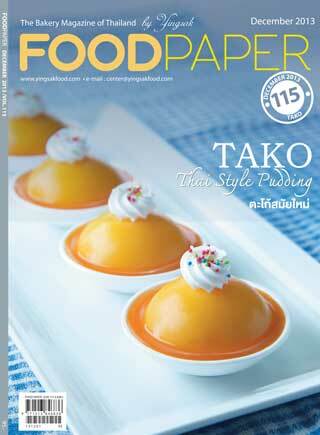 Food Paper is also published monthly under the administration of Dr. Yingsak Jonglertjesadawong, Thailand’s renowned culinary guru.